Today I want to talk to you about a training technique that I call, “The Simon Says Effect”. The psychological trick you can play on your dog to get him to start learning what cues he’s SUPPOSED to pay attention to. This technique is the the next piece off the Stop Barking Puzzle you MUST add to your training regimen that I showed you a few days ago in the video called, The MUTE method… for how to EASILY get your dog to stop barking with a STOP cue, and without using this Simon Says Technique, you will forever fail at getting your dog to stop barking when you ask. If you missed that Mute Method video, you can check it out by clicking the link above. So what is the Simon Says Effect anyways? Well I obviously stole this name from the popular childhood game of Simon Says. And in that game, there is one leader who is leading a group of people. The groups only goal is to only do things IF the leader first Says, Simon Says… if the leader says simon says touch your head, the group touches their head…. Or simon says jump, or simon says spin around, you have to follow his directions. But if he doesn’t say simon says and only says, jump or spin… and you follow his directions… you’re out. If you’re the leader, there’s a little trick that anyone who’s played this game quickly picks up on. 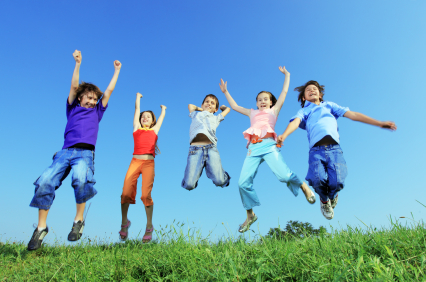 And that is that the easiest way to get people in the group to do a BEHAVIOR you HAVN’T cued, is to get the group in a rhythm of obeying you for 10-15 behaviors as quickly as possible, and then slip a quick behavior in on them without saying simon says first. Without fail, this always get’s a HUGE percentage of the group to mess up and obey the leader, even though they weren’t cued to. I call this phenomenon of getting people to do things that you haven’t cued the Simon Says effect, but with dogs I don’t use it to get the dog to do a behavior I haven’t cued, I use it to CHANGE the cue from what the dog THINKS it is, to what I want to change it into. 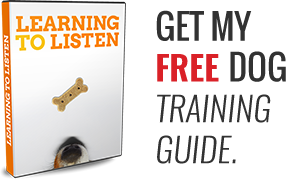 In my last dog training video where I outlined the Mute Method process for you, and your job was to get your dog to start barking reward, then stop barking over and over again as often as possible in a minute. I wanted you to do this so you could turn yourself into the so called “leader” in this simon says type of game we’re playing with your dog. If you’ve followed the guidelines in my Mute Method video your dog is getting a click and treat for barking… (which causes him to stop barking)… followed by a distraction cue (like a hand in his face) to make him pause for a moment… and a final treat for this last pause. Then repeat as many times in a minute as possible. Now this is important… if you think this drill doesn’t make sense, remember, we are only doing this to create a training environment where we can teach a verbal cue for stop so in the future we NO longer will HAVE to rely on giving your dog a treat to get him to stop barking. It’s at this point where your dog is stopping and starting non stop for a minute that you can start to no longer use the treats to get your dog to be quiet and simply insert the verbal cue “stop” instead of dropping a treat. Here’s how I would do this with my dog. First click when I hear him start barking up a storm. Then throw him a treat which rewards his barking, and STOPS the barking. Then while your dog is eating the treat you quickly and firmly say QUIET, with a hand in his face. This causes your dog to pause and take note of you. This pause is the REAL behavior we want to then click and reward with a treat. Everything we’ve done up until this point was just so that we could manufacture this reaction in our dogs as many times in a minute as possible. And without this process, you will not be able to practice this skill with enough repetitions for it to sink into your dog’s brain. But our works not done yet. Now we have to get the dog to stop barking without the first treat, and start obeying the hand and verbal signal all by themselves. Quickly do the exercise I’ve just shown you for 20 repetitions. If you’ve done things right, you should start to notice your dog begins to stop barking and stop barking before you even drop treats, or give hand signals. This is because the fast repetitions have caused him to switch from a reactive state of mind, to a predictive state of mind, where he’s anticipating what you want him to do and doing it before you tell him to… this is exactly what we want. When you notice your dog is starting to anticipate when he should start barking and when he should stop, it’s time to pull out the first treating process. Remember how we treated when he barked, made him pause with a cue, then rewarded the cue, and we’ve done this now 20 times in a row. On the 21st repetition we’re going to still ask him to bark like we have been, but instead of treating him when we bark, we’re going to pull a good ‘ol simon says maneuver on him and just give him the CUE for stop, instead of dropping the treat. 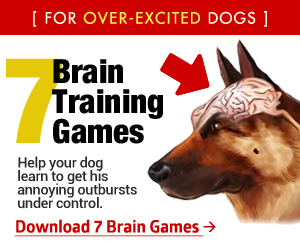 And because your dog is already anticipating that he’s going to have to stop, he should normally stop barking, at which point you quickly click and treat to reward his perfect behavior. Do you see what we did? We tricked the dog with the Simon Says effect by setting our dog up to think the cue to stop barking was one thing, and then turned it into something else entirely… a voice and hand gesture. 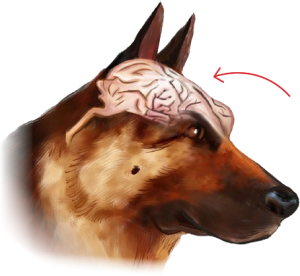 Because your dog is still getting a reward for stopping… with a few extra repetitions, he’ll quickly learn that he get’s rewarded for stopping and will start to always listen to you, by stopping the second he hears you command him to STOP… without any more power struggles. Now I realize this brings up some additional issues, like what if you don’t always have a treat handy, and what do you do with dogs who are so locked on to the person they’re barking at that you can’t get through to them. If those are issues that concern you, these are issues I show you how to quickly overcome in my Emotion Training program, that shows you strategies for using not only food rewards, but a wide variety of rewards to train your dog to be more calm, more obedient and less reactive in 8 common situations in every day life.